I’ll preface this with that I have not been a very big fan of Gripping Beast’s miniatures in the past, especially their medieval line of metals, but that opinion has been fixed with an introduction to their plastics. Gripping Beast’s plastic Viking Hirdmen have been out for quite some time, but this is the first opportunity that I have had to work with them. I first saw them when one of our locals Ancients players modeled a few up for a Viking army, and I thought they looked like a fairly nice kit, so my newest WAB project centers around them as a future army. Since they are fairly new to me, I thought I would give a brief review of them to give people an idea of what they may be getting into. Here we see the basic infantry sprue, lots of options for heads and weapons. The sprue is another Renedra sprue from GB’s creation, much like I have seen recently with the Perry’s, Warlord Games, and Conquest Games. The details are crisp and the quality is as good as anything that I have seen from Games Workshop or Warlord Games or the Perry’s, etc. The parts are arranged well and are quite easy to remove, with the exception of the tabs under the stand, but those are in a location where you can get a bit brutal removing them. So far I have not had any issues with flash. The flash is very minimal, even on the mail armor covering the bodies. They also come with this command sprue, shown below. The bodies on the command sprue are the same as the infantry, but the heads are different and of course it has some special items for your command and DIY characters. Talk about bang for your buck, this kit is one of the best for that. I picked mine up at Avatar’s of War (good to deal with people out east, check out their blog in my blog-list) for $32 and you get 44 miniatures. That’s an awesome deal for this high of quality. As always with me, I am a converter and hobbyist, and this is normally one of the things I complain about is head variations. I have not mastered sculpting heads yet so I need to rely on the companies giving me enough variations to work with. GB has certainly done that and then some on this kit. There really is only a couple of the heads that I don’t care for and even then those are not that bad. This is a supreme effort on their part and one I’ll definitely commend them for. The detail like on everything is very sharp. For me the one thing I will want, is some more un-helmeted heads as they give some nice character to the army. I’ll need to experiment with a few things and see about doing some head swaps. Good variations and large number of bodies is excellent. One of my criticisms for the kit though is that most of these appear to be squatting slightly. I’m okay with it. Kind of reminds of 40k Space Marines. I’ll get over that though. The detail like on everything is very sharp. And they have a large amount of weapons to select from which is really good. They are fairly easy to assemble in a variety of poses, below are some of the variations that I came up with, without even trying, just getting use to the kit and seeing what can be done. Warlord Games Barbarian, Perry Norman, Gripping Beast Plastic Viking, Conquest Games Mounted Norman, Gripping Beast Metal Viking, Warlord Games Roman Auxilary. All fairly comparable in size. 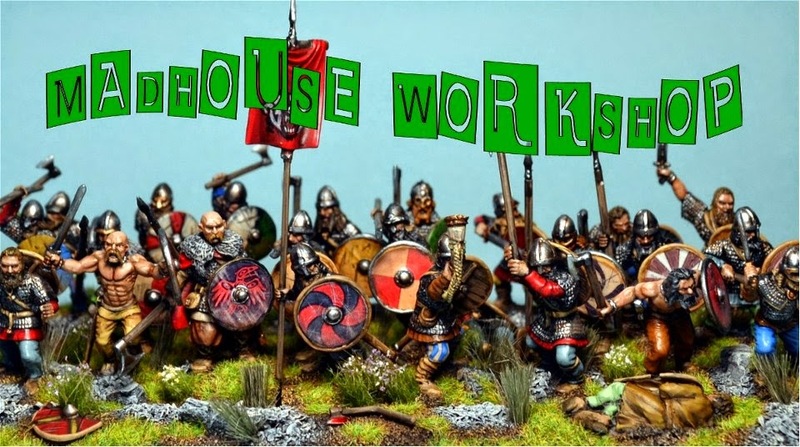 And for our Fantasy Buffs out there a comparison with Games Workshop models: Red Box Games Aenglish warrior, Empire Flaggelant with Ungor head, Gripping Beast Viking, Ungor with Flaggelant Head, Chaos Marauder, and another Gripping Beast Viking. Overall I really love this kit. I use to think that Games Workshop (even though they have had their fair share of flops) was the absolute, no questions asked, best in the business when it came to plastic kits. 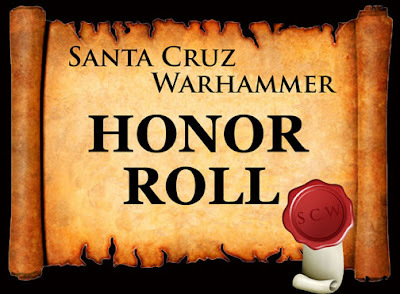 That is no longer, Gripping Beast, Warlord Games, Perry Miniatures, Victrix, and upstart Conquest Games are all stepping up to the plate and hitting homeruns in my book. The future looks bright for historicals. Great review & really helpful too! I'm looking to get hold of some GB Saxons & Vikings and this has spurred me on - thanks! Great review! I especially enjoyed the comparisons. I know this is two days short of two years late, and I have yet to read other articles on your site, but the Wargames Factory vikings are also very good and worthwhile investing in. While they do have awkward posing, the scaling is probably the most realistic I have seen in a miniature, and detail is on par with these Gripping Beast vikings. They are just okay I have used some in my Viking army but with mostly arms from GBP. The detail however on the WFs in my opinion is not on par with the GB Plastics. The cuts are very shallow on the Wargames Factory, the faces have very shallow detail, the mail is nowhere near as defined. WF is getting better though with each release. Nice! I've been thinking about returning to SAGA and I am a big fan of the Conquest Games plastics. I may have to check out the Gripping Beast ones as well. Your review was really helpful but I have one question that may be addressed in later blog posts however how well does kit swapping work with them? Do the parts interchange easily with the GW heroic stuff ? Any feedback on this would be helpful. Not really. Some heads like the ones from the Empire Flaggelants work, but mostly not. The bits do however work with other historic manufacturers.